Reduce the appearance of even stubborn under-eye circles with Skin Doctors EyeCircle cream. This innovative formulation also helps improve firmness of the under eye area to make your skin look younger and glowing. The cream features a new peptide technology that helps eliminate discoloration of the skin, while strengthening the skin density. EyeCircle cream contains a blend of vitamins, moisturisers and skin brighteners to help nourish the skin in the delicate eye area. So, if your dark circles are making you look tried and old, order for this eye cream now. Remember, if you place your order before 4 pm on any working day, then your product will be delivered the very next day. What are dark under-eye circles? Dark circles around the eye area are caused by the discolouration of skin due to various factors like sun exposure, stress and inadequate sleep. It is also believed that these circles are developed due to low blood circulation in the area. These under-eye circles become more noticeable with ageing. What is Skin Doctors EyeCircle? It is an advanced eye cream that combines latest breakthrough technology to reduce the appearance of dark circles around the eyes. This cream also helps smooth out fine lines and wrinkles that are caused by chronological ageing. Skin Doctors EyeCircle cream contains a revolutionary matrikine peptide called Haloxyl, which helps eliminate dark circles by breaking down the degraded red blood cells and strengthening the skin density in the eye area. It also features Walteria Indica extract and fruit acid complex, which helps brighten and soften the skin, while reducing pigmentation. Vitamin K and arnica help strengthen capillaries, while salicylic acid and retinol boost the cell renewal process. The cream is also enriched with powerful plant extracts that hydrate the skin and improve blood circulation in the area. 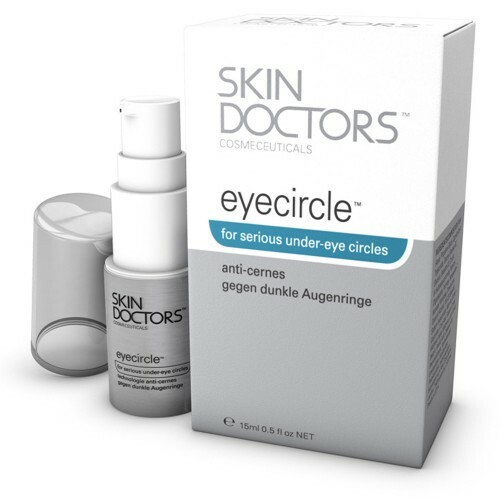 Apply the Skin Doctors EyeCircle cream onto the dark circles gently after thoroughly cleansing the skin. For optimal results, use the cream twice a day, preferably in the morning and at night before hitting the bed. Note: Do the patch test 24 hours before using the cream to ensure that you aren’t allergic to any ingredient. In case of irritation or any other allergic reaction, wash off the cream with cold water and discontinue the use. How to order Skin Doctors EyeCircle? You can place your order for this cream with SkinCareTotal simply by clicking on ‘Add to Basket’ option. We offer different payment and delivery option to suit your needs.